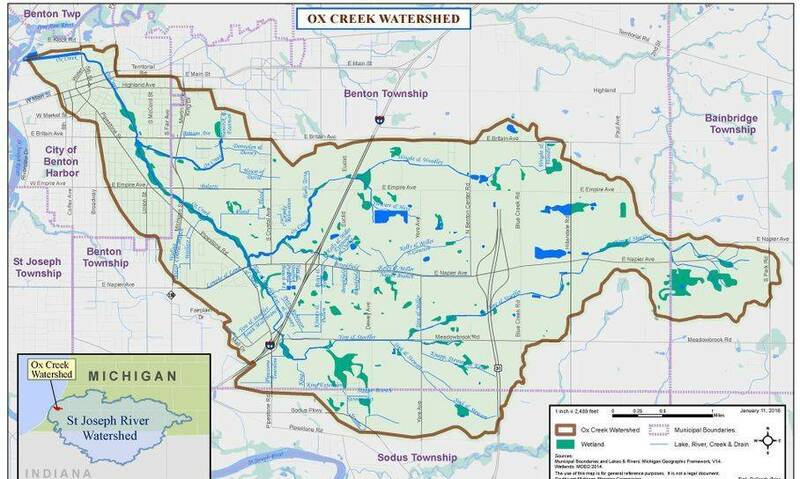 A Michigan Department of Quality Grant was issued to a group of partners for the Paw Paw Watershed.The Berrien Conservation District is one of the partners and we are focused on the Ox Creek, which a sub watershed of the Paw Paw. Although there are multiple threats to water quality in Ox Creek, the two biggest problems are sediment from agricultural operations and storm water run-off from the hundreds of acres of existing pavement, especially around the Orchards Mall area. Berrien Conservation District's role in the project aims to educate farmers about best management practices that reduce or even eliminate soil running off their fields and then affecting water quality. In addition, we are offering assistance to landowners interested in USDA funding for conservation practices for soil and water quality. The Wetland Reserve Easement Program for eligible land is also being offered. Why the Interest in Ox Creek? Ox Creek is a warmwater stream that flows through Benton Harbor where it joins the Paw Paw. It originates in agricultural lands east of the city and drains an area of 16.5 square miles. The lower portion of the watershed is heavily influenced by urbanization and storm water. 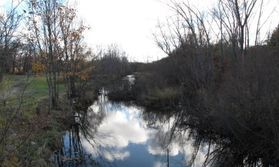 Ox Creek appears on Michigan’s §303(d) list because it is not meeting the “other indigenous aquatic life and wildlife” designated use; indicated by poor macroinvertebrate community ratings. Sedimentation, siltation, total suspended solids (TSS), and flow regime alterations are causes of the impairment. The other partners in the overall project are the Southwest Michigan Planning Commission, Two Rivers Coalition, The Southwest Michigan Land Conservancy, Sarett Nature Center, and Wightman & Associates. If you live in Benton Township, or the portions of Bainbridge and Sodus Townships as seen on the map , and are interested in a great opportunity to make a difference, please call us at 269-471-9111 ext. 3 and ask for Nancy or Suzy.